This dish features holiday colors and a variety of textures, from crisp watercress and crunchy pecans to juicy oranges and buttery avocados. To make the most of the presentation, use a combination of red and yellow beets. You can prepare the beets and dressing in advance, then just assemble the salad before serving. Preheat oven to 375°. Remove root and 1 inch stem on beets; scrub with a brush. Cut beets in half; place beets in a 13 x 9-inch baking dish. Add water. Cover with foil, and bake at 375° for 1 hour or until tender. Cool; rub off skins. Cut beets into 1/2-inch slices. Combine rind and next 6 ingredients (through pepper) in a small bowl. Toss half of juice mixture with beets. Cut avocado in half lengthwise. Slice each half into 12 slices. 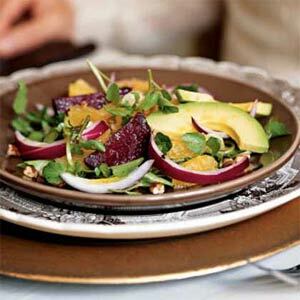 Place watercress on a platter; top with beets, orange sections, onion, and avocado. Drizzle remaining juice mixture over salad, and top with pecans. Serve immediately.